This precious kid turns six on Sunday. So today it seems fitting to share a bit of his God story with you. A longer version is also the next chapter in the This Odd House manuscript. And taken in that context, it represents a much-anticipated turning point. Of course, I had no idea who that little miracle would be. How he would come to us. Or what new levels of faith his arrival would require. But stripped of so many dreams. Of so much pride and control and reliance on self. I stood before the throne of God, waving a white flag. Declaring the demolition phase “done.” For the time being, at least. And begging for Him to begin to build me back. Two months later, I had a voicemail message. From a friend Tanya at church. Telling us that she had just heard about a seven-month-old baby boy. She had been praying all day, she said, and sensed God leading her to call us. We stared at each other for several moments. “What do you want to do?” Peter finally asked. As red raw as our hearts were (from Peter’s dad’s death, from infertility, from failed adoptions, from my mom’s passing and my dad’s decline), as much as I wanted to protect myself from further pain, I also knew that if we were ever going to be parents, we had to keep taking this risk. Peter nodded, and I called Tanya. She explained that she had received an e-mail from a pastor. An e-mail that went to a whole network of churches, so who knows how many other people were also privy to his plea—for someone, some family, to step up and stand in the gap for a seven-month-old baby boy who was coming up for adoption. Tanya gave us the pastor’s number to call. When we got home, though, Peter called Kari first. And she told us her story. That a friend of hers, Maggie, had been caring for a baby boy through the Safe Family program. Because this baby’s mother had pretty complex issues, the baby had been with Maggie for seven months. His whole little life. Kari said that the baby’s birthmom would not be able to parent, so this baby was coming up for adoption. Peter told Kari about Tanya’s call. “Do you think it’s the same baby?” Peter asked. One of my favorite Biblical accounts is God’s call of Moses in Exodus chapters 3 and 4. First, there’s that blazing bush. That obvious direction. That unmistakable display. That we all desire. Then there are Moses’ many excuses. To which I can relate. There are his fears. Four times he says to God, “But…but I…” I’m not worthy. Not wise. Not believable. Nor eloquent. Four times he persistently protests God’s plan. And each time God answers (patiently—until 4:14—when He gets a little bit peeved). Each time He answers. With a promise of His presence. Before we hung up, Kari gave us Maggie’s number. And we called her immediately, bracing ourselves for another door slam. But Maggie was thrilled. We were an answer to her prayers too. She told us that the baby slept well, ate well, and smiled continually. She also explained what she understood about his situation. That his birthmom probably couldn’t parent. That the case was going to juvenile court the following week. That the caseworkers were going to recommend adoption. But it would be up to the judge to determine what would be done. Peter and I thought and talked and prayed about Daryl all weekend. Begged for our own blazing bush. A clear call. And I fought back many fears. Voiced all of my excuses. My own, “But…but I…” I don’t know if this is right for us. If this is God’s call. If I’m able. If I’m ready. I’m not strong. And I’m not brave. I don’t want to be disappointed again. I don’t want to feel more pain. And I definitely don’t want to finally love a baby, then have to let him go. But in the din of all of our deliberating, we thought we heard a response. A whispered word. A promise of God’s presence. A “Behold, I…” And we knew. That God could close the door at any point. He had many times before. That was His prerogative. But it wasn’t our place to preempt Him. So on Monday morning, we called Maggie and told her that we wanted to find out more. That’s how we put it. We weren’t yet ready to commit. But we wanted to move cautiously ahead. She was thrilled, she said. And she would have her caseworker call us. Peter and I were both on Spring Break from our teaching jobs that week. So we hung around the house and waited by the phone that Monday. All day. By late afternoon, I was getting antsy. I gave Peter strict instructions to call me if he heard anything. And I drove over to Borders. To peruse the parenting shelves—a section I had avoided for years. I was flipping through the pages of What to Expect the First Year, mentally making a Babies-R-Us shopping list, when my cell phone rang. It was Peter, and my heart started pounding. Instantly, I was irritated. I did remember Audrey—a very nice girl who had been a student in both of our classes a couple of years ago—but I wasn’t interested in hearing about her just then. “Yes, I remember Audrey Cain,” I snipped, waiting to hear that she needed a job reference or had sent a wedding invitation. I hung up the phone and stood staring at the wall of baby books. Dazed. Could Audrey Cain be our burning bush? For the following two weeks, Audrey, Maggie, Peter, and I talked and e-mailed about Daryl every day. But with each conversation, the situation became more complicated, rather than more clear. 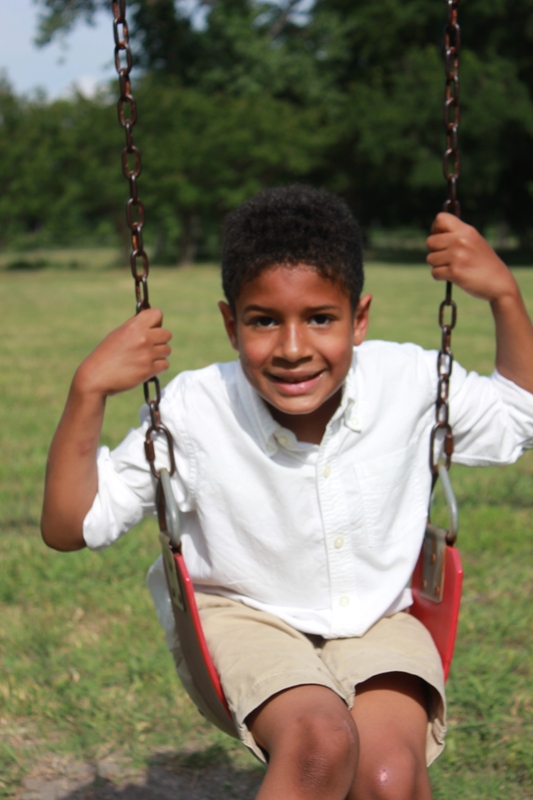 Daryl actually wasn’t “coming up for adoption.” He was coming into foster care. He didn’t need an adoptive family, at least not yet. He needed a foster home. And Peter and I weren’t licensed foster parents. Possibly…eventually…Daryl would be adopted. But there was no guarantee. And because his birthmom wanted to parent, it would be a long and difficult road. For the following two weeks, Peter and I asked everyone we could think of for advice. Some friends were excited about this possibility. Others, knowing our history of disappointment, were understandably concerned. One foster agency we called refused to work with us. But then the McHenry County DCFS office offered their support. One friend who works in the foster system said that this situation didn’t suit our desire to adopt. But then my boss agreed to give me some time off of work to be with Daryl if we brought him home. Our other caseworker Valerie, who was handling our China adoption, was perhaps the most persuasive voice. I called her one afternoon to fill her in and solicit her perspective. We had anticipated this hurdle. Audrey had even suggested that Valerie might help us get our foster license. That perhaps her agency could oversee Daryl’s case. So back-and-forth we went for days. One moment confident. The next shaken and confused. Until finally, one afternoon I collapsed on a chair in the office of Jan, a colleague and mentor. I told her I was afraid. Afraid of making the wrong decision. Afraid of suddenly becoming a mom. Afraid of letting our son slip through my fingers because of my fear. “What should we do?” I asked Jan.
She didn’t give me a chapter and verse. But God used her words. To tell me that—regardless of the result—I would never regret putting myself on the line for baby Daryl. But I would regret it if I didn’t. God used those words to show me that if I wanted my miracle, I was going to have to throw myself at His mercy. And He used those words to call me—not just into motherhood—but also into something more. A journey of complete surrender and utter dependence on Him. He used those words to tell me that He wanted to give me—not just a child to love—but even more than that, He wanted to give me Himself. “Radical Dependence,” Barna calls it. That comes on the other side of brokenness. I wish I could share more here. (God willing—you’ll just have to buy the book). I wish I could describe for you all of the miracles in Daryl’s story. All of the moments when God reached in with power and grace. All of the times he dropped our jaws. Providing just the right caseworker at just the right time. Giving us favor with a judge. And a lawyer. And Daryl’s birthmom. And DCFS. Parting the sea of the foster system when no one thought it possible. I don’t need to say that I wouldn’t trade Daryl for the world. He’s my son. And I have loved him deeply since I first laid eyes on his dark curly hair and his darling little dimple and his puddles of drool. But perhaps I do need to say this. That I also wouldn’t trade the journey. I wouldn’t trade how it has changed us. And I wouldn’t trade the front row seat I’ve had to watch Him at work. When have you heard God’s call? Maybe you hear it right now. What sort of surrender will it require of you? Happy Birthday, my darling Daryl Boy! You are so loved. Happy Birthday, Daryl!! Somebody had better pick up your book soon; I’m getting impatient! Thanks, Jill! 🙂 Maybe I need to come over and help you with your “odd house” renovation project and get some additional inspiration to finish this thing. Wow. What a wonderful story. God is so good. He is… amazing, wonderful, unpredictable, he is EVERYTHING. You have the best team mate on your side. Daryl is so lucky to have you and Peter as parents, and you guys are lucky to have Daryl! What a great blog. Keep them coming. Keep sharing. I applaud you both. Beautiful! Your postings have been so real and I and looking forward to reading the whole book. This made me cry, and I'm thankful it did. Your heart inspires me in so many ways, but how big and brave it is just speaks to me deeply. I have been blessed to hear the call lately. What I know about God-sized things prepared for us is that it's usually so much more significant than I realize (especially the smaller things he calls us to), but it is often much larger than I imagined. I'm very sure I'll be out of my comfort zone, out of my depth at times, and usually outside my usual habits. I'm pretty sure none of this is a bad thing. It may very well be a hard thing. I know answering the call is worth it, without question.